These pics can be "yuck", but the point is suggesting that a Kelly green and black scheme makes them look like they're copying another team makes no sense. A new set using this color scheme could look great on them, tie into their history, and still be a unique look in the NFL. I'm thinking New York Jets. The worst part about that set were the helmets. Black facemask and a green shell doesn't work. Because they previously had zero black across their branding and then suddenly added it when it became a trendy color - that's the definition of BFBS. It's a board discussing uniform and logo details. If the Dodgers added a black outline to their wordmark and numbers and just a little bit of black piping to the pants, it would stick out. I don't really feel one way or another about those Jets uniforms...but that's why people flip out. I'll never understand why some people on this forum flip out about the usage of black in these uniforms. Quick Mock based on Kelly Green/Oregon numbers and Black in Scheme. Obviously very bare bones but just trying to match what Connor Hughes Indicated. They have NY on their helmets now and have for 35 years of their history or so. Albeit it was always a bit obscured and in the background. Also the skyline. Wonder if that is hinting at something? I think you’re right that this is the main reason people give, but the way I see it, the Jets added black well before it became trendy in uniforms, and they ditched it before it really jumped the shark and filtered down to the lower levels of the sport. 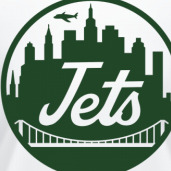 It’s strange to think about, but the Jets were on the forefront. They set the pace for two of the most significant movements of contemporary uniform design: the “black soup” movement of the mid- to late 1990s and the “return to the classics” movement of the early to mid-2000s. The worst part about that set were the helmets. Black facemask and a green shell doesn't work﻿. Couldn't agree more with these two thoughts. To me, this is absolutely the best the Jets have ever looked. It was a tasteful, balanced use of black to really separate the kelly green and white. I don't consider this "BFBS" because the black was NEVER forced to the front and center, and it actually made a huge difference. Imagine the same uniforms but without the black. It's a COMPLETELY different look. If the tiny use of black makes a huge difference but the black is never used prominently, then it's not "BFBS" to me. Just switch the black facemasks to white, and this could have lasted for decades. I based it off their Color Rush from this year, had similar stripes. i agree. i was born in '84, so this is what the jets looked like in my childhood. i'm a huge opponent of BFBS, but for whatever reason, the jets in this look never bothered me. as far as @VC15AP18's mock up, i could definitely get down with something like that. move the stripes to the sleeve and put TV numbers on the shoulders and i'd be good with it. This is all they need to do. 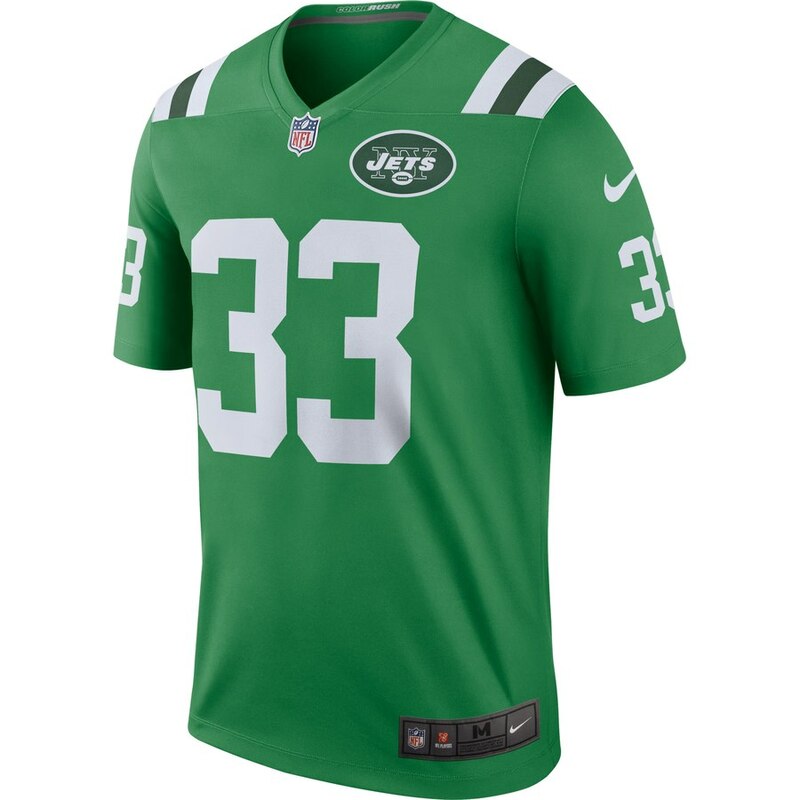 Keep sleeve caps on the white jersey and make green shoulder stripe match the jersey. Change the black to dark forest green and more traditional number font and we might have a classic for the next 20 years. I agree but it really seems like they are going to add black, i just hope its minimal. I don't like the Oregon style numbers either, ever since those Bucs jersey's i'm scared to see what Nike does. I should say, the mid-90s set for the Jets weren't bad. The helmets were still lame but for the most part, it wasn't bad. It reminds me of the Knicks set from the 2000s that used black in a similar way and those I thought were done really well. The downside is that those (like the 2000s Knicks) were used during some really REALLY bad embarrassing times for the Jets. I think they only had 1 good season in those sets. Guys these unis are gonna be awful. I can just feel it. Don't worry though, they'll change them again in 5 years. Imagine the same uniforms but without the black. It's a COMPLETELY different look.